Nvidia’s portable gaming tablet, the Nvidia Shield has proven a useful platform for the company to try out its mobile chipsets in a tablet. The company’s proven quite adept at shrinking desktop grade graphics performance to mobile level, with the Nvidia Tegra K1 even having made an appearance in Google’s Nexus tablet last year. Well, we’ve been hearing word repeatedly about a successor for the original Shield, and by the looks of things now it things might be moving fast over at Nvidia. Nvidia’s Shield 2 Portable Gets Certified In South Korea – Device Coming Soon? Nvidia’s been rumored for quite a while to be preparing a Tegra X1 successor to the original Shield. While the Tegra K1 brought Kepler to mobile processor, handhelds and graphics, with the Tegra X1 Nvidia managed to take things to another level entirely. The chip comes with 256 Maxwell cores on board and is fully capable of supporting DirectX 12. On the CPU side of things, the Tegra K1 comes with two clusters of Cortex A53 and A57 respectively. Its also capable of supporting 4K video. 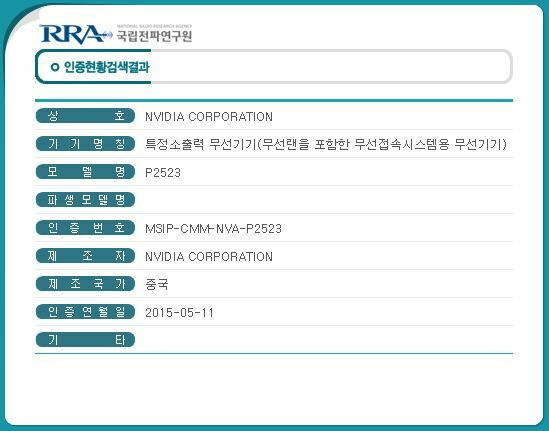 So Nvidia’s Shield 2 appearing in the South Korean equivalent of the FCC is good news for gaming enthusiasts all around. It also adds an official source to the increasing list of speculations and rumors surrounding the Shield successor and points towards things progressing on the next Shield quite quickly at Nvidia. Today’s RRA listing comes with a similar internal codename that’s been spotted at Wi Fi Certification and other sources as well. Nvidia’s P2523 been making several rounds so we should expect the device to be with us sooner than later. Since things are moving fast with certifications, Nvidia should be launching the device within the next couple of months. Stay tuned, we’ll keep you updated and let us know what you think in the comments section. Nvidia’s Shield Portable 2 Spotted – Codenamed “Loki”, Powered by the Tegra X1?